​​This Lopi wood inserts flush wood fireplace insert deliver extraordinary heat and advanced design. The Flush Wood Plus Insert can heat up to 2,000 square feet, with longer burn times and less wood! With a large viewing area and flush to fireplace design, this insert provides a traditional fireplace look with modern efficiency. Also, the glass remains clear do to the innovative air wash system. Don’t show any power cords! The Flush Wood Plus Insert - features a blower which can use the hard-wiring option kit to eliminate the look of power cords. 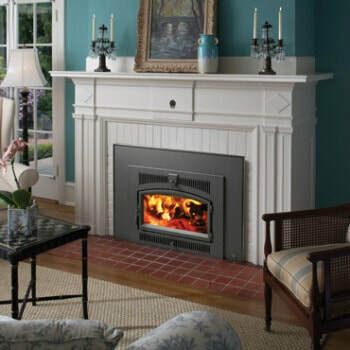 This unit is perfectly crafted to fit into zero clearance and masonry wood fireplaces. Lopi has completely eliminated slow, open door startups with the Greenstart ignition system. Simply load the wood into the firebox and push the button!